June is the 60th anniversary of the signing of the landmark legislation that established the United States Interstate Highway system. Now known as the Dwight D. Eisenhower National System of Interstate and Defense Highways, the system presently is composed of more than 47,000 miles of highway in all 50 states and Puerto Rico. In the summer of 1919, Lt. Col. Dwight D. Eisenhower was part of a convoy that endured a cross-country trip on the nation’s primitive roads to determine the feasibility of moving an entire army across the North American continent. A quarter century later, as General in World War II, Eisenhower noted the efficiency of Germany’s Reichsautobahn system. Both of these experiences inspired and solidified his advocacy for creating a national highway system. Decades before Eisenhower’s convoy, the Good Roads Movement was begun by cyclists and bicycle manufacturers for the purpose of improving roads between cities and to emulate a European approach of government supported road building and maintenance. 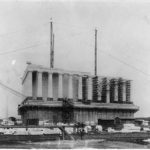 With the advent of motor vehicles at the beginning of the 20th century, the Good Roads Movement was continued by those with automotive interests. The East-West Lincoln Highway (1913) and the North-South Dixie Highway (1915), both developed by auto parts industrialist Carl Fischer, are early examples of private roadbuilding. Eisenhower’s convoy followed the Lincoln Highway for much of its route. By 1916, the U.S. government entered the highway business, with Woodrow Wilson’s signing of the Federal Aid Road Act of 1916, the first federal highway funding legislation in the United States. The act provided matching funds to the states for roadway construction. Within a year, every state had a highway agency to administer the federal funds. The program was managed by the Bureau of Public Roads, a precursor of today’s Federal Highway Administration. In 1922, the Bureau of Public Roads commissioned Gen. John J. Pershing, former head of the American Expeditionary Force in Europe during World War I, to draw up the Pershing Map, the first blueprint for a national highway system in the United States. 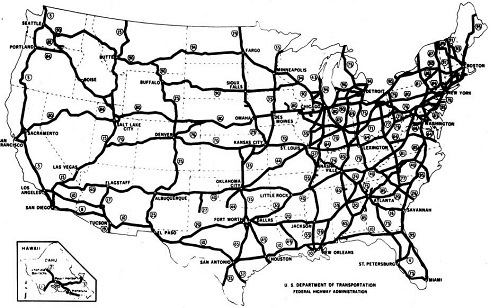 Pershing compiled a detailed network of 20,000 miles of interconnected primary highways. 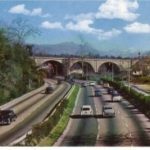 The next 20 years saw the creation and expansion of the “United States Numbered Highway System,” an integrated network of parkways, urban highways, and rural connectors, mostly with unrestricted access. 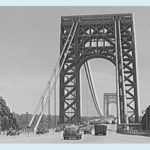 In 1939, President Franklin Roosevelt endorsed “Toll Roads and Free Roads,” a letter from the Secretary of Agriculture to Congress outlining the need and feasibility of a national system of limited access superhighways to combat congestion in metropolitan areas. The report identified and advocated three primary east-west routes and three primary north-south routes, and proposed the adoption of design standards for construction of the system. 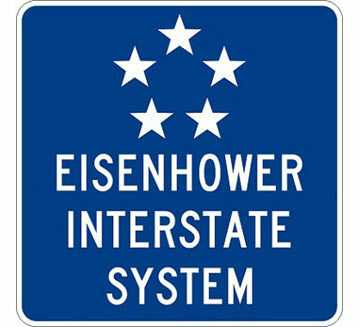 Throughout the 1940s, construction of the system was slow, but by 1952, Eisenhower made an interstate highway system a top priority of his presidential campaign. 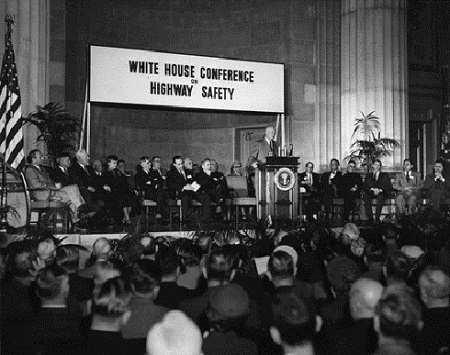 President Eisenhower speaks at the White House Conference on Highway Safety. The Federal Aid Highway Act of 1954 authorized $175 million for an interstate system, to be distributed on a 60/40 percent federal/state basis. The Eisenhower administration demanded a more comprehensive interstate network of highways to support civilian needs, including economic development, improved highway safety, and congestion relief, as well as to address “the appalling inadequacies to meet the demands of catastrophe or defense, should an atomic war come.” The price tag of building an interstate system would be $27 billion, with $25 billion coming from the issuance of bonds to be paid over three decades by a gas tax. In his January 1956 State of the Union Address, Eisenhower once again advanced the cause for an interstate system. Five months later, Congress produced legislation that called for 90 percent federal funding, with money coming from a Highway Trust Fund that received the revenue from the federal gasoline tax. Without fanfare, the Interstate Highway System was authorized by the Federal Aid Highway Act of 1956. The bill was signed into law June 29, 1956, by President Eisenhower while lying ill in the Walter Reed Army Hospital.